TWENTYNINE PALMS >> A jet fighter pilot killed in a crash during a training exercise in Twentynine Palms on Thursday has been identified as a 36-year-old Arcadia man, the U.S. Marines announced Saturday. 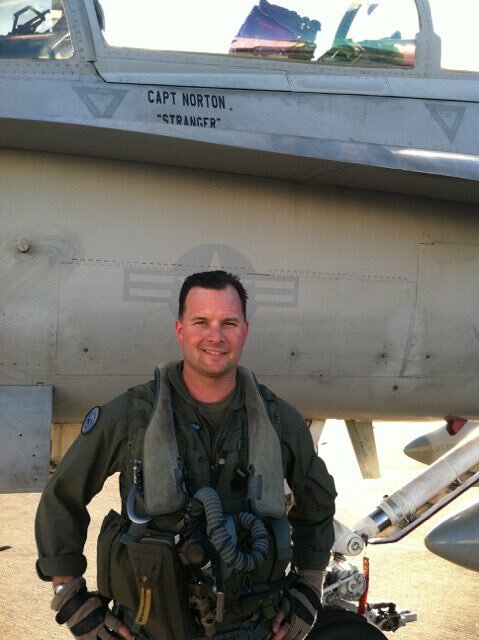 Third Marine Aircraft Wing pilot Maj. Richard “Stranger” Norton died in the F/A-18C Hornet crash, which took place about 10:30 a.m. Thursday near the Marine Air Ground Combat Center Twentynine Palms, U.S. Marine Corps officials said in a written statement. Norton was based out of Third Marine Aircraft Wing based in Miramar. He was a pilot in Marine Fighter Attack Squadron 232, Marine Aircraft Group 11. Col. William Swan, commanding officer of Marine Aircraft Group 11, offered his thoughts and prayers to Norton’s family. Maj. Mark Wise, commanding general of the Third Marine Aircraft Wing, also offered his condolences to the fallen Marine’s loved ones. Norton had taken off from Miramar to conduct close air support as part of a pre-deployment training exercise when the crash occurred, according to the Marine Corps statement. The cause of the crash remained under investigation. Norton was commissioned in the Marine Corps in March of 2005, officials said. He deployed to Afghanistan in 2012 in support of Operation Enduring Freedom, and he deployed multiple times to Japan, officials said. He is a recipient of the Navy and Marine Corps Commendation Medal, as well as the Navy and Marine Corps Achievement Medal with gold star. PHOTO of Maj. Richard Norton courtesy of the U.S. Marines. SAN MARINO >> Police in San Marino are seeking two men who carried out an armed bank robbery Thursday afternoon. The robbery took place at 1:52 p.m. at One West Bank, 900 Huntington Drive, according to San Marino police Detective Brian Wong. The two robbers entered the bank and one of them pulled a handgun and pointed at a teller working behind the counter, Wong said in a written statement. Both robbers fled the scene in a red SUV with an undisclosed amount of cash, he said. Police described both robbers as black men, between 20 and 30 years old. One was about 5 feet 9 inches tall, of thin build, wearing a light-colored long-sleeve shirt and a baseball cap with an unknown logo on the front. The second robber was heavy-set, wearing a light-colored shirt, tan shorts and a baseball cap. The FBI joined San Marino police in the investigation. Anyone with information is asked to contact Detective Wong at 626-300-0719. Tips may also be submitted anonymously to L.A. Regional Crime Stoppers at 800-222-8477. FONTANA >> A memorial service is planned today for a Fontana man who died after his girlfriend allegedly intentionally ran him down with a car in Valinda. 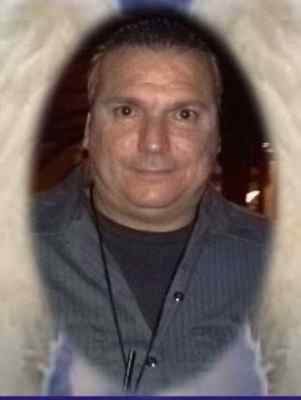 A service in memory of Randolph “Randy” John Morales, 51, is planned for 1 p.m. at Saint Nicholas Byzantine Catholic Church, 9112 Oleander Ave., daughter Priscilla Morales said. The family only recently received his ashes. Randolph Morales died after his girlfriend, 52-year-old Sharon Hood of La Puente, struck him with a car during an argument during the early-morning hours of May 8 outside a motel in the 500 block of North Azusa Avenue, in the unincorporated county area of Valinda, Los Angeles County sheriff’s officials said. Hood is being held in lieu of $2 million bail pending trial, records show. Her next court appearance was scheduled Aug. 30 in the Pomona branch of Los Angeles County Superior Court. WHITTIER >> Five young men robbed a group of young men in the drive-through of a Whittier hamburger restaurant Friday before tracked down and arrested via a stolen cell phone, authorities said. The robbery took place shortly before 6 p.m. at Tam’s Super Burgers, 13448 Lambert Road, Whittier police Lt. Aaron Ruiz said. Five young men were inside of a car in the drive-through when five other young men — one armed with a handgun — approached on foot, Ruiz said. The robbers demanded property from the victims, who turned over cell phones and other items, the lieutenant said. The robbers fled. “One of the victims was able to track is cell phone to an address in the 9800 block of Armley (Avenue),” in the unincorporated county area of West Whittier, Ruiz said. Deputies responded to the home and detained five suspects, who were ultimately booked on suspicion of robbery, he said. Eugene Trejo, Erick Vega and Dennis Gonzalez, all 18 and from Whittier, were arrested along with two 17-year-old boys, whose names were withheld due to their age, Lt. Bryan Ellis said. Trejo, Vega and Gonzalez were being held in lieu of $50,000 bail each at the Whittier Police Department’s Jail pending their initial court appearance, Los Angeles County booking records show. The two juvenile suspects were taken to Los Padrinos Juvenile Hall in Downey, Ellis said. INDUSTRY >> California Highway Patrol officers will be screening drivers for sobriety during a checkpoint tonight in the unincorporated county area between Industry and West Covina, officials said. The checkpoint is scheduled to begin about 9 p.m. and continue through Saturday morning, CHP Officer Rodrigo Jimenez said in a written statement. Funding for the checkpoint is being provided by a grant from the National Highway Traffic Safety Administration, through the California Office of Traffic Safety. PASADENA >> Police arrested a Monterey Park man Thursday after he broke into several Pasadena businesses and cars, then attacked a business owner who confronted him with a brick, officials said. Brian Anthony Wheeler, 45, was booked on suspicion of burglary, assault with a deadly weapon and making criminal threats following the incident, which unfolded about 6:25 a.m. in the 1000 block of South Arroyo Parkway, Pasadena police Lt. John Luna said. A business proprietor caught Wheeler leaving his businesses, where a window had been smashed out with a brick, police said. Wheeler had stolen a can of beer. Wheeler attacked the business owner with the brick, leaving him with redness to his face but no serious injuries, Luna said. The attacker fled from the area, trying unsuccessfully to steal a car. Witnesses pointed responding police officers in the direction where the fleeing suspect had jumped a fence onto Marengo Avenue. Officers found Wheeler hiding in the community laundry room of a nearby apartment complex, Luna said. Investigators soon found other windows allegedly smashed by Wheeler. “Prior to this incident, the suspect attempted to enter two adjacent business and (several) cars,” Luna said. Officials suspected Wheeler was under the influence of some sort of narcotic, he added. According to county booking records, Wheeler was being held in lieu of $50,000 bail pending his initial court appearance. DIAMOND BAR >> Deputies tried their hand at goat-herding Wednesday after about 70 goats escaped from a Diamond Bar field where they were being used to clear brush, authorities said. 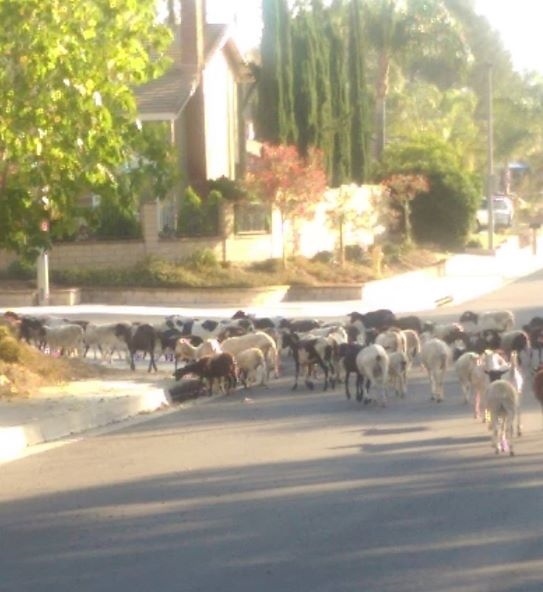 Deputies first received a report just before midnight on Tuesday that a large group of goats had broken loose and was wandering in the area of Canyon Ridge Road, Los Angeles County sheriff’s Sgt. Hugo Reynaga said. Officials did not locate the wayward herd in the darkness, he said. 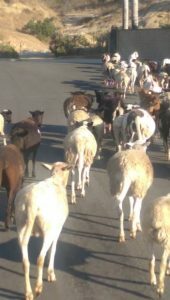 But about 6:30 Wednesday morning, a second caller reported seeing the goats wandering along Fallow Field Drive, chomping on grass as the went. 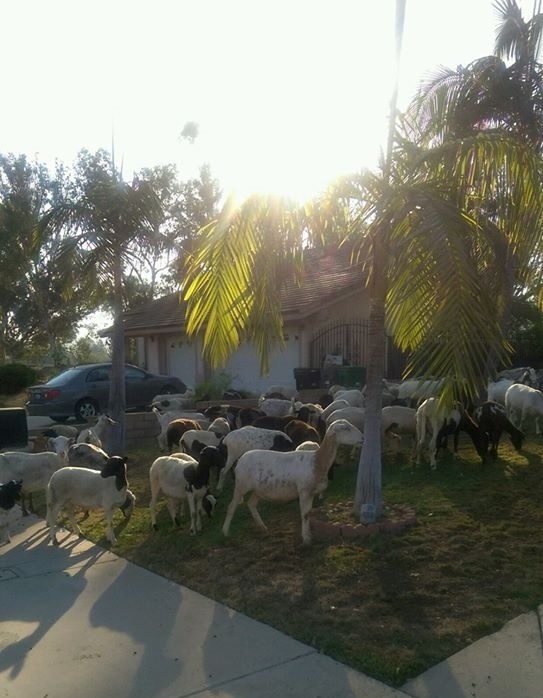 “Deputy (Aaron) Scheller was able to corral the goats in the front yard of a residence, turn them around and herd them back to a nearby open field,” sheriff’s officials said in a written statement. SOUTH EL MONTE >> South El Monte Mayor Luis Aguinaga agreed to plead guilty to a federal bribery charge Thursday after being charged with regularly collecting cash payments from a city contractor over the course of seven years, officials said. In his plea agreement, the mayor admitted to taking bribes every two to three weeks from a contractor who conducted business with the city, U.S. Attorney’s Office spokesman Thom Mrozek said in a written statement. “The payments were rewards in connection with the approval of city contracts for the contractor,” Mrozek said. The bribes, which were initially $500 at a time but later increased to $1,000, were paid between 2005 and September of 2012, prosecutors allege. Under the plea agreement, Aguinaga admitted taking at least $45,000 in bribes. The contractor, identified in court documents as a “confidential witness,” left the bribe money for Aguinaga by placing cash in envelopes dropped in a bathroom at South El monte City Hall, or left inside the passenger-side pocket of a car, Mrozek said. One meeting between Aguinaga and the confidential informant was monitored by undercover FBI agents, he said. In some cases, such as the FBI-monitored meeting, Aguinaga took some of the money to give to another “City public official” who was not identified in court documents. “Mr. Aguinaga abdicated his civic duty when he made decisions for the city based on bribes he demanded, instead of for the good of the people he was elected to serve. The FBI will not tolerate corruption by city officials, nor should the residents of South El Monte,” according to Deirdre Fike, assistant director in charge of the FBI’s Los Angeles Field Office. He is scheduled to appear in federal court in Los Angeles Aug. 10 for an arraignment hearing, officials said. A conviction for bribery carries a maximum sentence of 10 years in federal prison. BALDWIN PARK >> A California Highway Patrol pursuit instantly turned into a rescue operation Wednesday after a fleeing stolen SUV with three people inside crashed and burst into flames in Baldwin Park, authorities said. All three occupants of the car suffered significant injuries but were expected to survive following the crash, which took place shortly after 2:20 p.m. at Garvey Avenue and Big Dalton Avenue, CHP Officer Rodrigo Jimenez said. Officers were chasing a stolen Toyota RAV4 when it crashed and burst into flames, he said. The same officers then pulled the driver and two passengers from the burning wreckage. Officers were chasing a stolen Toyota RAV4 when it crashed and burst into flames,” he said. “What these guys did was heroic,” Jimenez said. Driver Ruben Cabrera Jr., 35, of Montebello was booked on suspicion of auto theft, felony evading of police causing great bodily injury and possession of methamphetamine. He was also already being sought for alleged parole violations. Cabrera suffered injuries including broken ribs in the crash, Jimenez said. He was treated for his injuries before being booking into jail. A 27-year-old woman who was riding as a rear passenger suffered a mostly-severed arm, the officer said. Surgeons had reattached the arm Thursday, however the ultimate prognosis was unclear. A 16-year-old girl who was two to three months pregnant and riding as a front passenger in the SUV suffered injuries including a broken wrist, Jimenez said. Officers first spotted the Toyota RAV4 speeding in the fast lane of the westbound 10 Freeway near Puente Avenue, Jimenez said. The SUV suddenly exited the freeway at Fransicquito Avenue and blew through a stop sign at Garvey and Vineland avenues. Officers tried to pull the SUV over, but the driver sped off, initiating a chase, he said. But the driver lost control of the vehicle as it rounded a bend where Garvey Avenue becomes Big Dalton Avenue, striking several trees and shearing a fire hydrant, Jimenez said. The SUV’s gas tank ruptured and the RAV4 burst into flames, he said. The pursuing officers suddenly became rescuers as they freed the three trapped occupants from the burning car, Jimenez said. Officer managed to pull out the rear passenger and discovered the 16-year-old passenger also trapped in the front passenger seat. As the fire continued to grow larger, the officers cut the seat belt of the third and final occupant and freed her from the flaming wreck, Jimenez said. According to Los Angeles County booking records, Cabrera was being held without bail at the Inmate Reception Center in Los Angeles pending his initial court appearance, scheduled Friday in West Covina Superior Court. COVINA >> Sheriff’s detectives and worried family members sought the public’s help Thursday in finding a Covina grandmother who disappeared more than two months ago under suspicious circumstances. 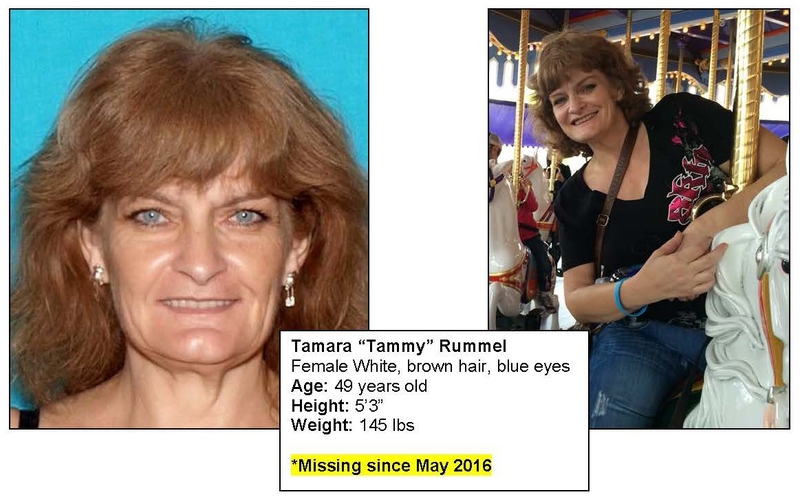 Tamara “Tammy” Rummel, 49, was last seen on May 20 on surveillance camera, accompanied by an unidentified man, using a an ATM machine in Covina on the afternoon of May 20, according to Deputy Lilian Peck of the Los Angeles County sheriff’s Information Bureau. Just before arriving at the Covina bank, Rummel is believed to have left her home in the unincorporated county area of Covina, “in an unfamiliar sports-utility vehicle with an unknown person(s),” Peck said in a written statement. Detectives released bank surveillance camera photos of Rummel and the unidentified man in hopes of generating leads. Authorities had yet to determine whether the man seen in the bank surveillance camera images is the same who left Rummel’s home with her earlier in the day. Rummel is a mother of four grown children and a “doting grandmother” of six, Peck said. She retired from a position as media director with a resource center for parent’s with special needs children about a decade ago. Rummel is described as white, 5 feet 3 inches tall and 145 pounds. She has light brown hair and blue eyes. 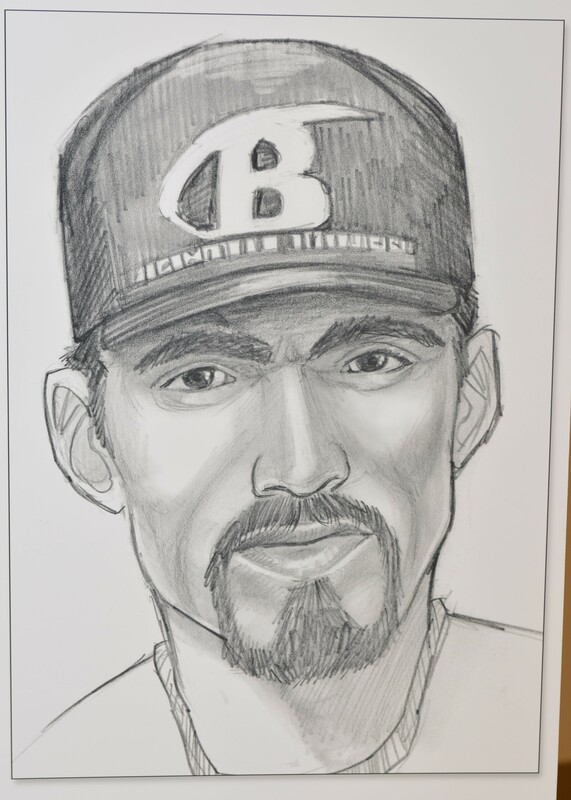 Investigators also released a composite sketch of the man who accompanied Rummel to the ATM. The person of interest pictured with her in the bank surveillance camera photos wore a white T-shirt and a baseball cap with a logo, possible a “B,” on the front. Anyone with information is asked to contact Sergeant Ken Perry or Sgt. 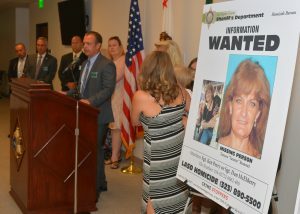 Dan McElderry of the sheriff’s Homicide Bureau’s missing persons unit at 323-890-5500. Tips may also be submitted anonymously to L.A. Regional Crime Stoppers at 800-222-8477.